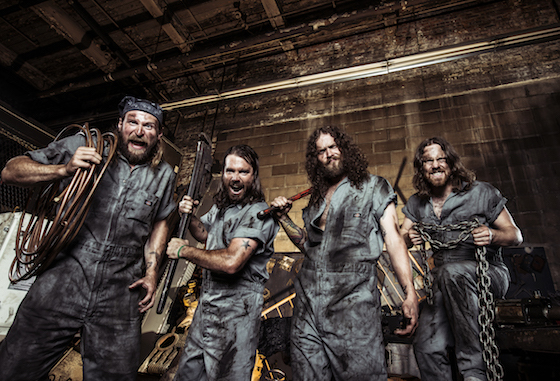 Few things go together quite as well as hard rock and NASCAR racing, so Hamilton rockers Monster Truck have opted to bridge the gap and sponsor their very own vehicle in a forthcoming race. According to a press release, the group have sponsored the #24 JLG Racing Toyota Camry driven by Brandon McReynolds. McReynolds is set to use the Camry in this weekend's Xfinity NASCAR race at the Talladega Superspeedway, which will be broadcast on FOX on April 30. Ricky Bobby would be proud. Further, Monster Truck will be in attendance at the race, with plans to air segments about their band and McReynolds' car on FOX throughout the weekend. Check out an image of the Monster Truck-sponsored car below, where you'll also find the band's upcoming tour dates in support of Sittin' Heavy. This isn't the first time Monster Truck have completed a weird sponsorship. Last year, they opened up about sponsoring a peewee hockey team. Here's hoping their next endeavour will be sponsoring an actual monster truck.